Mshak Moradi is a human conspiracy theorist and hacker who often tried to work with reporters and journalists. Mshak Moradi, a conspiracy theorist, often sent his opinions and theories to reporters and journalists, including Petra Janecek. Moradi left a voice message in Benjamin Giraud's inbox during the production of Giraud's series of biographical interviews about John-117 in 2558. Moradi's message concerned the discrepancy between Deon Govender's narrative, which placed John in Elysium City in 2524, and a hard copy census registry which listed John as having died in 2517. While Commander Michael Sullivan assured Giraud that the discrepancy was due to bureaucratic errors introduced by the glassing of Eridanus II, Moradi insisted that there was a cover-up in action. Moradi later helped Giraud get in contact with Anthony Petrosky, a retired Orbital Drop Shock Trooper that witnessed boxing incident involving John and several ODSTs aboard UNSC Atlas. Moradi told Giraud how to secure his line; regardless, he hacked into his network to ensure that the line was fully secure, as Giraud had done it wrong. Later, out of desperation for sources, Giraud contacted Moradi, who ensured their call was secured. He informed Giraud that the Master Chief has gone AWOL and some UNSC personnel even consider him to be a traitor. Moradi revealed that mysterious events were happening in deep space. However, Giraud had to end their conversation, as he was called down to the Office of Naval Intelligence's Boston headquarters by Sullivan. Moradi was contacted by an Insurrectionist leader known only as "FERO". She had him to cross flight itineraries so that Giraud would encounter actor Jakob Walker—who had been hired by ONI to act as one of their sources for Giraud—on his flight from Boston. After Giraud's encounter with Walker incited him to post all of his findings and recordings online for the public to see, Ray Kurzig and Petra Janecek arrived at his apartment, expressing their annoyance that Giraud had uploaded recordings of them online without their permission. When Giraud informed them that he had kept his line secure with the help of Moradi, Janecek claimed that Moradi was probably listening to them from Giraud's COM pad; to Giraud's surprise, he was. Moradi revealed how he had hacked into Giraud's network several weeks earlier and helped keep his line safe by rerouteing rogue monitoring bots, scrambling drone surveillance, and had Giraud placed on the same flight as Walker. Moradi revealed that the individual that contacted him was called FERO. After Kurzig and Janecek left, Moradi revealed that FERO was about to contact him. The various theories scrawled by Mshak on the wall of Sankar's safe house. Shortly after Ben leaked their compiled data to the senate, Moradi sent Giraud a message telling him, with uncharacteristic worry, that there was something important that Moradi had to tell him in person. He claimed he would come over to Giraud's location in a few days to tell him, but Giraud never heard from him again. This caused him to speculate that ONI had discovered Mshak's location and either killed him or taken him prisoner. Commander Maya Sankar, the real person behind "FERO", was ordered to kill Mshak by ONI because he was about to discover her real allegiances. After she had carried out the assassination mission, Sankar's handler Noah Reibach noted that her weapon had not registered as fired during the operation; in response, she only implied that she had killed Moradi without it in a particularly gruesome manner. In reality, Sankar could not bring herself to kill Moradi and instead hid him in her personal safe house on Binterall. Knowing it'd be too risky to let Mshak continue accessing Waypoint and risk ONI discovering his survival, Sankar cut off her house from all Waypoint sources and left him under virtual house arrest. In the months without online access to any news sources, Mshaki grew more unhinged, turning to reading books and scrawling conspiracy theories to pass the time. But shortly after October 27th 2558, Sankar returned and gave him net access again in hopes that he could confirm to her the news of the Master Chief's death. In a relatively short search across "the slush", Moradi found transmissions by the religious group Triad, who seemed to have inside knowledge about the mysterious colony disasters that the Chief's death coincided with. However, he and Sankar didn't have long to search, as ONI found their safe house and sent a strike team to attack. Fleeing for their lives, Moradi along with the rest of Sankar's party fled the planet on her personal ship but were captured by Kig-Yar pirates. Moradi, Sankar, and Bostwick were all taken aboard the Rampant Perdition, a Jackal pirate ship. They were all going to be thrown out of the airlock by the Kig-Yar but Sankar managed to convince them that they had valuable assets and were instead taken to the Perdition's Shipmistress Chur'R-Zhal. Sankar managed to convince the Jackals to spare them, but only briefly as the pirates demanded an unpayable ransom and they were sent to one of the ship's brigs. Inside the brig, Moradi and the others encountered a dying Sangheili who was previously on a diplomatic mission on a human colony and he had information on the anomalies. Before the Sangheili died, he blamed humanity for bringing the anomalies upon them and said they were only the beginning. With this new information, Moradi and Black-box were arguing briefly about what to do with it before being cut by Sankar who believed the information didn't matter as they weren't going to be able to escape. Bostwick attempted to re-motivate her by reminding her of the inspiration she'd made as FERO. As she did so however, the Kig-Yar returned and took her to be dissected alive by the crew. With the aid of Black-box, Sankar and Moradi managed to escape the brig. Sankar told Moradi to wait and hide in the hangar bay as she went to go save Bostwick. As Moradi and the others were going to escape the shipmistress and her crew caught them and was considering how to have them punished. Sankar however convinced the shipmistress to free them in exchange for repairing the ship's slipspace engine. Having fulfilled their terms, Moradi and others were let go by the Kig-Yar. With the aid of Black-Box, Moradi learned that the next colony that would be hit by the anomaly would be Laika III. On their way to Laika III, their ship was attacked by Ilsa Zane. Their ship crash landed, and most of the party was recovered by Dasc Gevadim and his Triad followers who believed that the impending event that was going to happen was divine ascendance. As the event started, Bostwick came to Moradi and Sankar with a Warthog and picked them all up while the Triads were distracted. Heading for New Hedmark, they were confronted by both UNSC and Ilsa Zane's NCA forces but managed to escape both. The Guardian set off an earthquake in the city of New Hedmark, that threatened to leave nearly all in the city dead. Realizing nothing could be done to save the colony, Sankar and Bostwick decided to go to a communications building in hopes of getting the truth of what was happening out to the galaxy. Sankar had Moradi flee the planet, away from the reach of destruction the Guardian was causing. Moradi's current whereabouts are unknown. Moradi was energetic, annoying, and unpredictable. He was frequently cheery about the data he had procured even if what it stated was morbid, and confident in his abilities to find secrets and avert ONI's radar. He would often persistently nag a target about something he had found and wanted to share, only to disappear for days and leave taunting voicemails to anyone who tried to call him. Mshak had a unique manner of speech that involved strange analogies. He also hated being kept from online access, going nearly insane when held in Maya Sankar's house and having no electronics to turn to. Undercover ONI operative Maya Sankar considered him to have a "heart of lettuce", sparing him from assassination after witnessing his lack of combat skills. When faced with a threat to his own life, Moradi panicked and was easily overpowered by her, even running into a wall when attempting to flee. Despite his unprofessionalism, Moradi was skilled at combing through "the slush", and even managed to hack ONI's flight and passenger schedules. 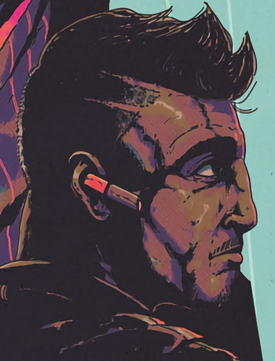 Although he often spied on allies and manipulated what they encountered, Moradi claimed to have a code of honor in that he'd give someone a choice before offering them the chance to aid his hacking efforts. Moradi was a gamer in his spare time. Prior to his house arrest he was an avid player of the online game Unggoy Farmer, and was almost always high ranked on its leaderboards until his capture by Sankar kept him from playing it anymore. Moradi is voiced by Kumail Nanjiani, a Pakistani-American comedian, actor, and podcast host.